Authors: Kshitij Chaudhary , Arjun Dhawale , Ram Chaddha , Vinod Laheri . Musculoskeletal tuberculosis, especially spinal tuberculosis is a challenging scenario. The disease presentation varies and profile of the organism is changing rapidly with rise of antibiotic resistance. The management protocols need to be revisited in light of new information and current review is aimed at achieving this goal. This review article is a summary of the symposium conducted by Bombay Orthopaedic Society at KEM Hospital in November 2016. The focus of this discussion was primarily on nonoperative management of spinal tuberculosis including focus on diagnostic protocol and medical management controversies. Surgical aspect of the disease is also covered with recent advances in the spine surgical protocols mentioned in brief. Keywords: Spinal Tuberculosis, diagnosis, antibiotic resistance, surgery. Spinal tuberculosis is the most common infection affecting the skeletal system in our country, and if incorrectly treated, can have devastating and permanent sequelae. The emergence of drug-resistant tuberculosis and HIV has turned this age old infection into a deadly and terrifying disease. Poor socioeconomic conditions and an unhygienic living environment contribute to the persistence of the infection in our society. Poor access to quality healthcare and indiscriminate and unscientific use of second-line antibiotics has stoked the fire as we stand and stare helplessly at the impending epidemiological disaster. It behooves us as representatives of the medical community to educate ourselves and others regarding this problem and practice recommended treatment guidelines. The most common presenting symptom of spinal tuberculosis is back pain or neck pain. Most patients seek consultation after weeks or months of pain as the onset is usually insidious and progression is slow. Frequently it is mistaken as benign low back pain, and treated with painkillers as the early radiographs are often normal. Patients may experience constitutional symptoms (reported incidence varies between 17-54%), however, compared to pyogenic spondylodiscitis fever, anorexia, fatigue are less common. Therefore, the clinician should maintain a high degree of suspicion, especially in patients who complain of ongoing pain for more than a month, have rest pain, or if associated constitutional symptoms are present. In addition, as tuberculosis affects the anterior column primarily, a knuckle deformity, i.e. prominence of a single spinous process might be one of the early signs of tuberculous spondylodiscitis. Some patient can also present with a cold abscess in remote locations like the posterior triangle of the neck (cervical spine TB), along the ribs (thoracic spine TB), or in the inguinal region (lumbar spine TB). The clinician should also maintain a high degree of suspicion in immunocompromised patients, especially HIV infections, and should also be wary of patients with a history of tuberculosis, or those who have come in contact with tuberculosis patients.Unfortunately, in our country, many patients are diagnosed late and present with complications that may require surgical intervention. There are two main complications of spinal tuberculosis – spinal deformity and neurological deficit. The spinal deformity that typically develops as a consequence of anterior spinal column destruction is kyphosis. The kyphosis is usually of an angular variety that can cause long-term consequences if severe. The most grave among them is late-onset myelopathy due to a stretch of the spinal cord over an internal gibbus. In children, kyphosis can continue to progress after healing. The children who are more likely to have progressive deformity are identified using the “spine at risk” signs as described by Rajasekaran. These radiographic signs are seen when the posterior elements become incompetent, thus resulting in progressive deformity.Neurological deficits are mainly seen in cervical and thoracic tuberculosis. The cause of neurological deficit can be “soft” or “hard” compression (described in detail in the section on radiological features). Another rare cause of neurological deficit is inflammatory vascular thrombosis of spinal arteries resulting in spinal infarct. There are no diagnostic imaging findings to diagnose a spinal infarct, and this is usually a diagnosis of exclusion. Standard radiographs, anteroposterior and lateral views, are used commonly as the first line of investigation; however, they suffer from several disadvantages. Radiographic changes are usually not apparent until more than 50% of the vertebral body is destroyed, thus delaying the diagnosis. Junctional areas and posterior elements are difficult to visualize. Disc space narrowing with endplate erosions (paradiscal lesions) are early radiographic signs. With progressing and destruction of the spinal column, the radiographs may show varying degree of focal kyphosis due to vertebral body collapse. A paraspinal abscess may cast soft tissue shadow, which in the thoracic spine may be difficult to differentiate from the descending aorta. Abscess in cervical spine will show up as an increase in retropharyngeal space and those in the lumbar spine may result in asymmetry or bulging of the psoas outline. In chronic cases, calcifications in abscess wall are pathognomonic of tuberculosis. Calcifications are formed because, unlike pyogenic bacteria, MTB lacks proteolytic enzymes. Progression of kyphosis or vertebral body destruction early in the course of chemotherapy (first three months) should not be considered as a sign of treatment failure. MRI is the imaging modality of choice for spinal TB and can detect infection early in its course. Paradiscal involvement is the most common type of lesion. Central body, subligamentous, posterior element tuberculosis can also sometimes be encountered. The entire spine should be screened as noncontiguous lesion are seen in 16-71% of patients. The recommended protocol for imaging is presented in Table 1. In many parts of the country, the diagnosis of spinal TB rests on imaging findings on MRI. In an endemic country like ours, the clinician usually is right because the odds are in his favor. However, there are no pathognomonic imaging features of spinal TB that can reliably differentiate it from other spinal infection or tumors. Hence, tissue diagnosis is mandatory and recommended. 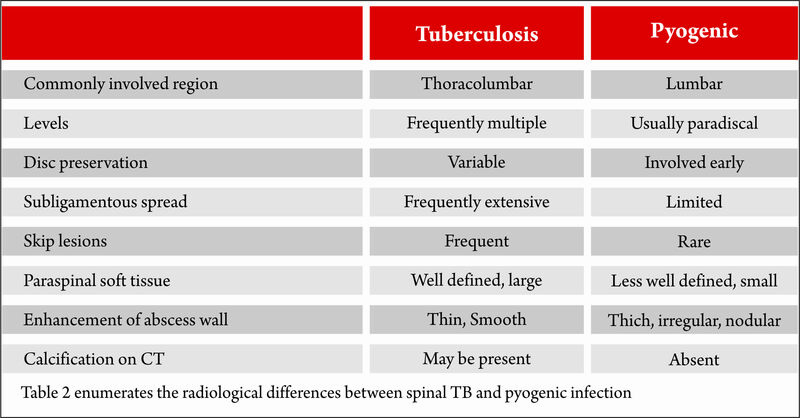 Table 2 enumerates the radiological differences between spinal TB and pyogenic infection; however, it is important to remember that these have a poor predictive value. Brucellosis frequently affects the lumbar spine. Anterior osteophytes (parrot beak) is a typical radiological feature on radiographs. Intradiscal air is identified in about one-third cases. Fungal osteomyelitis is difficult to differentiate from spinal TB on imaging. Metastasis or spinal tumors frequently affect the pedicle and spare the disc. The paravertebral soft tissue involved in lymphomas demonstrates a low signal on T2 MRI. However, noncaseating or granular varieties of spinal TB may look similar. 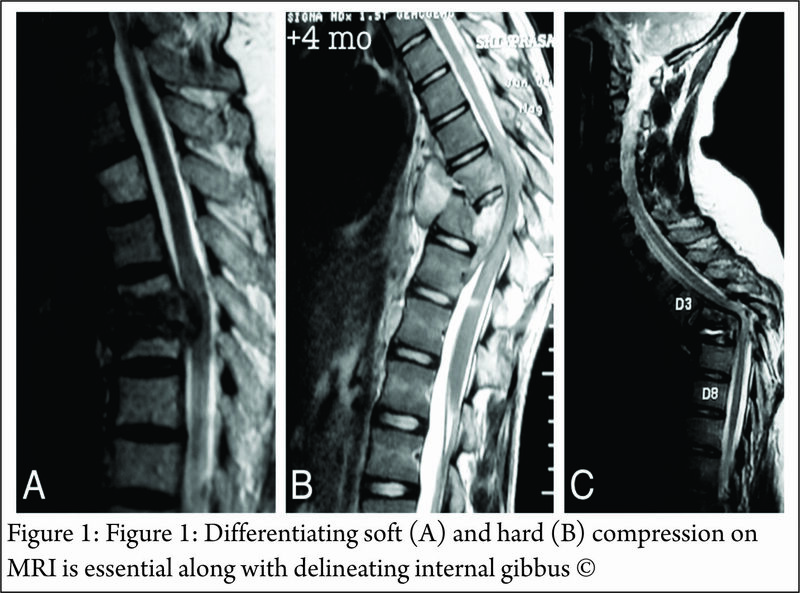 Early infection and type 1 Modic type degenerative changes may look similar, although a high signal in the disc should raise the suspicion of infective spondylodiscitis.MRI is useful for another purpose – to diagnose the type, extent, and severity of epidural spinal cord compression (Figure 1). “Soft” compression should be differentiated from “hard” compressions as this has implications for the management of the patient. Abscess (diffuse hyperintense T2 signal and hypointense T1 signal) and caseous granulation tissue (heterogeneous hyperintense to isointense T2 signal) are “soft” compressions. Bony sequestrum and retropulsed disc (hypointense T1 and T2 signal) are “hard” compressions (Figure 1). Translations and internal gibbous causing spinal cord compression is another example of “hard” compression. “Hard” compressions that cause neurological deficit cannot be treated with chemotherapy alone and usually require surgical decompression. Rarely, non-compressive lesions, such as vascular infarct or meningeal inflammation) are the cause of neurological deficit. It is extremely difficult to prove these as the cause of spinal cord dysfunction, especially in patients with epidural spinal cord compression. CT scan is primarily used to assess the extent of osseous destruction accurately before surgical intervention, especially in extensive infection. In some situations, it may help differentiate “hard” from “soft” epidural compression. As we have seen, there are no pathognomonic imaging signs that can reliably differentiate spinal tuberculosis from other spinal infections or tumors. Hence, a biopsy to obtain tissue for histopathological and microbiological diagnosis is mandatory to confirm the diagnosis of spinal tuberculosis. Besides, the mounting incidence of multi-drug resistant tuberculosis has made biopsy unavoidable. The yield of spinal biopsy is variable and depends not only on the expertise of the surgeon or radiologist doing the biopsy but also on the availability of specialized, well-equipped laboratories and microbiologists. Access to such facilities is non-existent in resource-poor regions of our country. However, there is a particular subset of spinal tuberculosis patients in whom biopsy is mandatory as in these patients the probability of encountering drug resistance is high (Table 3). 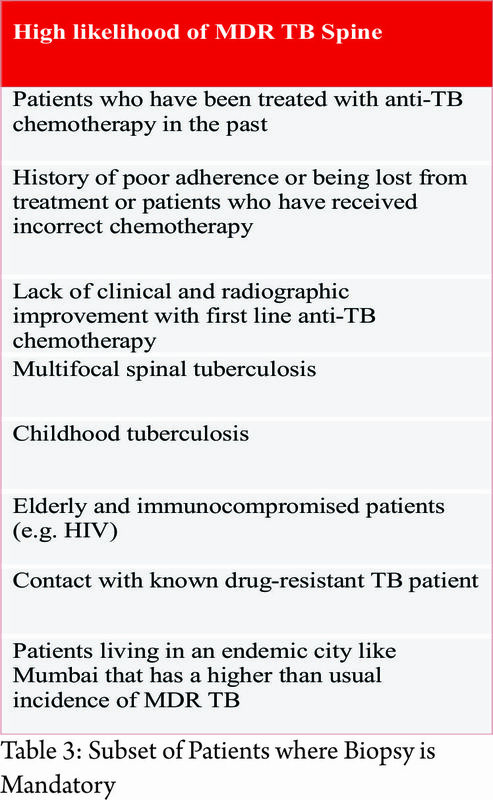 In patients with uncomplicated spinal TB (i.e. patients who are not planned for surgical intervention), a closed core biopsy is indicated. CT-guided core biopsy is ideal to acquire a representative sample safely, however, when unavailable, a fluoroscopy-guided biopsy can work as well, especially if the target area is easily accessible. Core biopsy (10-14G bone biopsy needle) is preferred to fine needle aspiration cytology or FNAC (18-22G needles) as the diagnostic yield of the latter is poorer. In any case, aspiration biopsy if required can always be performed via a core biopsy needle. Higher microbiological yield is obtained if paraspinal or prevertebral abscesses are targeted for pus sample rather than bone cores. If the patient has multiple sites of spinal TB, a more easily accessible and safer area is chosen. The biopsy can be performed via a transpedicular or extrapedicular approach, and the choice depends on the target area of biopsy. Anterolateral approach is required in cases of cervical spine TB. The neuromuscular bundle can be displaced manually, and the needle can be placed under CT image guidance. This technique requires considerable expertise and a confident radiologist. Biopsy for craniovertebral tuberculosis can be performed either transorally or via a posterolateral approach. Microbiological samples are collected in sterile containers in saline (2-3ml is enough for the purpose is only to keep the tissue hydrated; if a large quantity of saline is used the lab has to centrifuge to isolate the tissue) and sent immediately to the lab. Histopathological samples are collected in 10% formalin. The following tests should be ordered on the samples (Table 4). Definitive diagnosis of Mycobacterium tuberculosis infection rests on positive microbiological culture from the tissue sample. The traditional method of culture using Lowenstein-Jensen solid medium has been replaced with BACTEC™ MGIT™ liquid cultures. MGIT cultures are more sensitive (50 to 60% in osteoarticular tuberculosis) and can give faster results. Results are available in a few weeks (maximum 45 days) (Figure 2). Prior treatment with chemotherapy can lower the yield and hence when possible it is better to perform a biopsy before initiating chemotherapy. It is not recommended to stop chemotherapy if the patient is on antitubercular medications only for the purpose of biopsy. If the results are positive, one should ask for phenotypic drug sensitivity testing (DST) for first-line drugs. 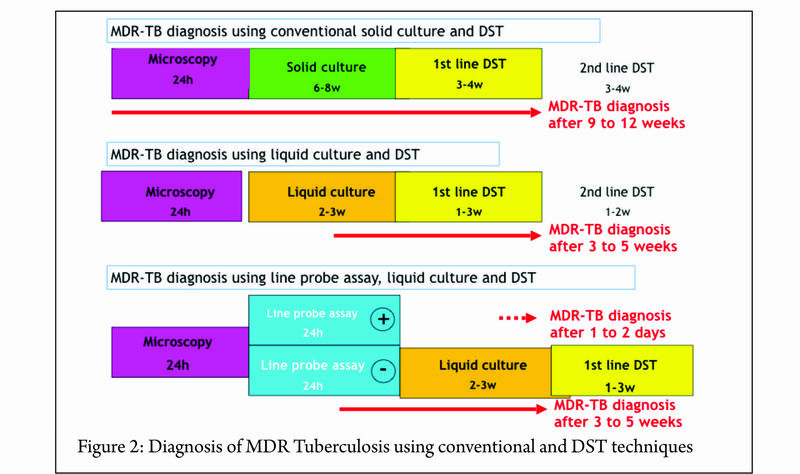 In addition, phenotypic DST can be done for second-line drugs if one suspects MDR tuberculosis. The approximate cost of BACTEC™ MGIT™ liquid cultures is Rs. 1000-1500. First-line DST costs about Rs. 4000-5000 and second-line DST costs about Rs. 5000-6000.Most labs will also perform direct smear and AFB staining before putting the sample in for culture. The sensitivity of direct smears is poor (less than 10%) in osteoarticular TB cannot be relied on to make a diagnosis. Histopathological diagnosis is usually obtained in about 60% of spinal TB patients. The classical histopathological features are caseating necrosis, epitheliod cell granuloma, lymphocytic infiltrate, and Langhans giant cells. It is important to remember that granulomas can be detected in other infections and inflammatory disorders as well. Therefore a positive HPE diagnosis can only suggest a probable diagnosis of mycobacterial infection. AFB staining of HPE samples can sometimes detect mycobacteria (not necessarily Mycobacterium tuberculosis), but as with direct smear, the sensitivity is quite low. It is a good custom to always ask for pyogenic bacterial cultures as well. This practice may detect a primary pyogenic infection or rarely secondary bacterial infection in addition to tuberculosis. It is also important to consider the possibility of fungal infections in susceptible and at-risk patients. GeneXpert is a new molecular test that detects the presence of Mycobacterium tuberculosis DNA. The main advantage is its rapid turnaround time. Results are usually available within 6 hours. It can detect Rifampicin resistance as well and thus aid in starting MDR treatment early in the course of therapy. As it is a DNA-based test, the specificity is 100%. However, the sensitivity is quite low of osteoarticular tuberculosis (about 60 to 70%). Therefore a negative GeneXpert cannot be used to rule out tuberculosis infection. The test is not widely available, especially in remote areas of the country. However, wherever feasible, it can be a useful adjunct to the above tests. The approximate cost is about Rs. 1500-2000 and in many centers, it is available free of charge through public-private partnerships under the DOTS program. Line probe assay or LPA is another DNA PCR-based molecular test that is specifically used for detecting drug resistance. The first-line kit detects Isoniazid and Rifampicin resistance and aids in the diagnosis of MDR-TB. The second-line kit detects Ethambutol, cyclopeptides (Capreomycin, Kanamycin, Amikacin and Viomycin) and fluoroquinolone resistance and aids in the diagnosis of XDR-TB. WHO recommends its use for smear-positive respiratory samples only. However, this test can be used as an alternative to phenotypic DST after MGIT cultures are positive. The results are available within 48 hrs (compared to phenotypic DST which requires about 3 weeks) and a diagnosis of MDR or XDR can be established (Figure 2). The information provided by this test can streamline MDR or XDR therapy earlier in the course of therapy. It is not recommended to rely only on LPA results as monoresistance to drugs not included in the kit can be missed. Therefore, phenotypic DST is always required to complete drug sensitivity testing. If the patient has a low risk for drug resistance, then phenotypic DST is adequate. If the patient has a high risk for drug resistance, then LPA followed by phenotypic DST is advocated if the clinician wants to establish the diagnosis of MDR or XDR to guide therapy. The main disadvantage is the cost. First-line kits cost Rs 2000-3000 and second-line kits cost about Rs. 5000-60005. Other investigationsCBC, ESR, CRP are a measure of disease activity and are frequently used to monitor therapeutic response to chemotherapy. They are more likely to be markedly abnormal in pyogenic infection compared to tuberculosis. Xray Chest should be done, as up to 67% patients may have either active focus or healed sequelae of pulmonary tuberculosis. Tests to detect HIV should be performed in high-risk patients or patients presenting with extensive or atypical spinal TB. Serological tests (IgM, IgG titers) and interferon release assays (Quantiferon TB Gold, TB-SPOT test) cannot differentiate latent from active infection and are not recommend by WHO. Mantoux test is of limited value in an endemic country like India. LFT and RFT are ordered as a baseline before starting chemotherapy and later to monitor side-effects. and hence fixed dose combinations should be avoided (e.g. Tab AKT 4 kit has 450mg Rifampicin that is inadequate for more than 60kg individual). There is no evidence to show that corticosteroids improve or enhance treatment effect of antibiotic and may be detrimental. However, it is a common practice (although not evidence-based) to start a short course of steroids for patients presenting with an acute neurological deficit. There is a lack of consensus regarding the ideal duration of multidrug chemotherapy for spinal TB. WHO recommends nine months of treatment for TB of bones and joints (2HREZ + 7 HR) because of the serious risk of disability in addition to difficulties in assessing treatment response. British Thoracic Society (BTS) recommends six months (2HREZ + 4 HR) of chemotherapy. American Thoracic Society (ATS) recommends six months of chemotherapy in adults and 12 months in children for spinal TB. Inadequate or unessential, prolonged duration of treatment should be avoided. Under the newer regime (National TB program), DOTS is no longer supportive of alternate day therapy, and daily treatment is recommended. The common adverse effects are nausea, vomiting, hepatitis (HRZ), peripheral neuropathy (H), discolored body fluids (R), color/night blindness (E), joint pains (Z). It is best to consult the treating physician if the patient develops adverse effects as the drugs may need to be modified or discontinued. The risk of developing tuberculosis (TB) is estimated to be between 26 and 31 times greater in people living with HIV (PLHIV) than among those without HIV infection. HIV-positive patients are more likely than HIV-negative patients to have extrapulmonary TB or smear-negative pulmonary TB. HIV testing is recommended in patients who were diagnosed with TB. The preferred recommendation for many TB-HIV patients is to start and complete TB treatment, and then start ART (antiretroviral therapy). However, if the patient’s clinical status is poor (other signs of HIV clinical stage 3 or 4 or CD4 count is less than 350/mm3), it may be necessary to refer the patient for ART treatment sooner. If patient is not on ART, start TB treatment immediately, or if already started, continue TB treatment. The treatment response is mainly monitored using clinical and radiological evidence. Biochemical markers such as CBC, ESR, and CRP are not reliable markers to assess healing. Clinical response to healing is judged by resolution of constitutional symptoms, weight gain, improved appetite, reduction in spinal pain, and progressive increase in activity. Radiographs may show initial deterioration, however eventually healing is seen as remineralization of bone and sclerosis of vertebral bodies. The end result of healing may be spontaneous fusion or a stiff fibrous ankylosis. Routine interval MRIs on follow-up are not recommended, especially in the initial few months of antibiotic treatment. A paradoxical worsening of MRI findings can be noted up to 3 months, and this is believed to be secondary to an immunological response to the dying bacilli. MRI is indicated if there are reasons to suspect drug resistant or poor response to antibiotics. MRI findings of healing are a resolution of marrow edema with or without its conversion to a fatty marrow. An abscess may get walled off, and sterile collections may be encountered on MRI for years following the termination of treatment. Hence, by itself, abscess on MRI at the end of treatment is not taken as a sign of persistence of infection.If the clinical and radiological response is poor or inadequate, the surgeon must consider these possible scenarios: 1) drug resistance, 2) late responder, 3) mechanical or instability related pain, or 4) incorrect diagnosis of spinal TB. This may require a repeat biopsy or assessment of spinal column stability using dynamic or weight bearing radiographs. If the diagnosis is in doubt, in spite of following this protocol and the patient continues to deteriorate, a surgical debridement and column reconstruction may be indicated. TB is defined as resistance to at least both Isoniazid and Rifampicin. Extensively drug-resistant tuberculosis or XDR-TB is defined as resistance to any fluoroquinolone and at least one injectable second-line antibiotic in addition to Isoniazid and Rifampicin resistance. One of the primary reasons for the emergence of MDR strains, apart from the rise of HIV co-infection, is the indiscriminate and unscientific use of multi-drug chemotherapy by clinicians, making it one of the most dangerous iatrogenic creations. In addition to the high morbidity and mortality risk, the drug therapy for MDR-TB is potentially toxic and can have permanent sequelae (Table 6). India ranks second amongst the high-burden MDR-TB countries. A very high percentage of MDR strains (51%) have been reported in an urban center in Mumbai compared to 2% in a rural center. A 30% primary drug resistance in pediatric spinal TB patients has been reported at tertiary referral center in Mumbai. Following are the principles of management of MDR-TB:1. Early detection of MDR and prompt initiation of effective treatment are important for successful outcomes 2. A biopsy is a must, and all efforts must me made to culture the organism to obtain drug sensitivity testing. 3. A lab competent in microbiological testing should be chosen. 4. It is imperative to involve a chest physician or an infectious disease specialist for treatment. 5. Never add a single drug to a failing regimen 6. 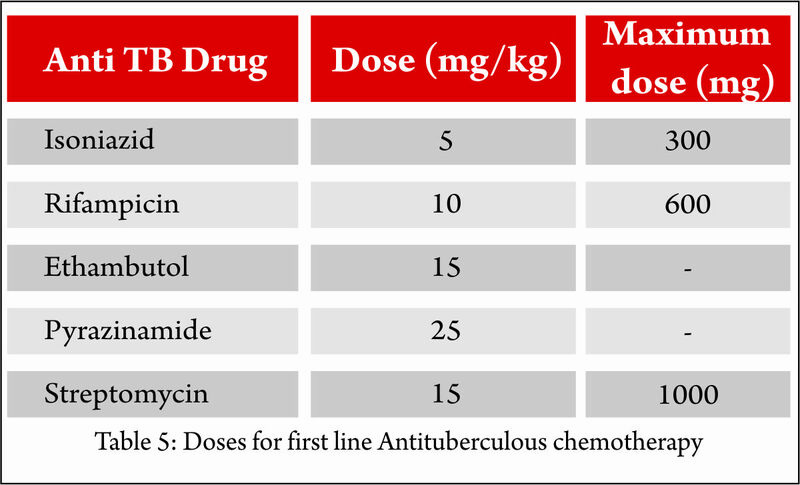 MDR-TB regimen should be composed of at least five drugs likely to be effective, including four second-line anti-TB drugs that are likely to be effective plus pyrazinamide 7. One chosen from group A, one from Group B and at least two from Group C 8. Agents from Group D1 are added if they are considered to add benefit. 9. The total number of anti-TB drugs to include in the regimen needs to balance expected benefit with the risk of harms and nonadherence when the pill burden is high. 10. In the treatment of MDR-TB, an intensive phase of 8 months is suggested for most patients, and the duration may be modified according to the patient’s response to therapy. 11. In the treatment of patients newly diagnosed with MDR-TB, a total duration of 20 months is suggested for most patients, and the duration may be modified according to the patient’s response to therapy. Spinal tuberculosis is a medical disease, and surgery is reserved for its complications, the most common being neurological deficit and spinal deformity. The decision for surgical intervention is also dependent on the age, primarily because of the risk of progression of deformity in children during the active infection as well as after healing.With the advent of multi-drug resistant tuberculosis, the middle-path regimen described by Tuli needs to be revisited. 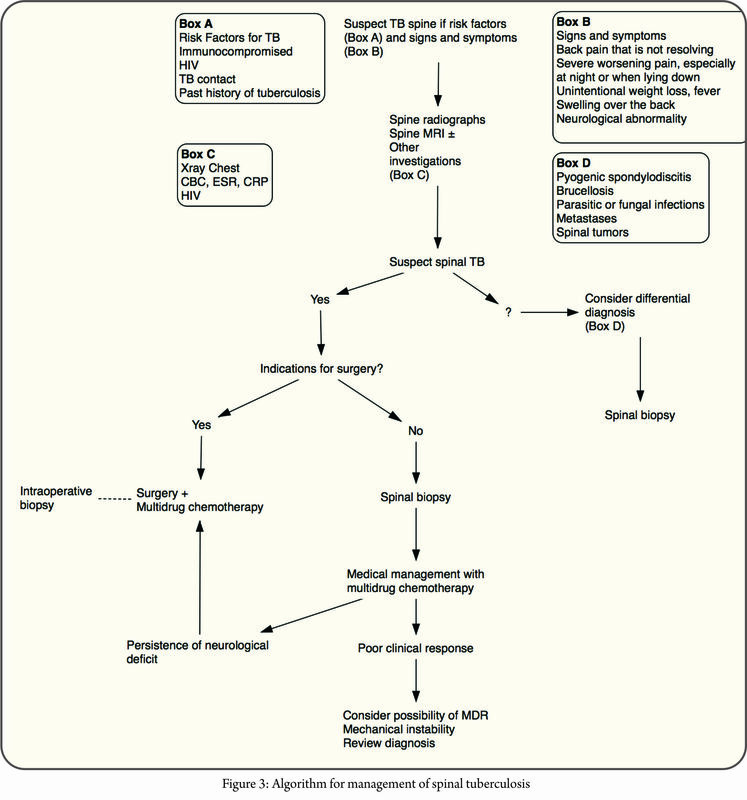 A biopsy and MGIT culture to determine sensitivity are mandatory and should be sent for all surgical cases. The suggested algorithm is presented in Figure 3. 8.1.1. Neurological deficitThe decision to operate a patient with weakness primarily depends on the cause of epidural spinal cord compression. As we have seen, “soft” or “hard” spinal cord compression can cause a neurological deficit. In general, patients who present with spinal cord dysfunction due to “hard” spinal cord compression are not amenable to medical management. These patients are best treated with surgical decompression. Patients with who present with deficits due to “soft” spinal cord compression (abscess and granulation tissue) are more likely to respond to medical treatment if the deficits are mild. In these patients, the indication for surgery are the following:17. Severe neurological deficit (inability to walk across the room) at presentation18. Worsening neurology on chemotherapy19. No improvement in neurological deficit with at least six weeks of chemotherapy20. New onset neurological deficit on chemotherapy. Childhood spinal tuberculosis deserves a special mention here. Tuberculosis infection in a child can result in a malignant progression kyphosis. In children too, the severity of deformity is related to the degree of vertebral body loss. Rajasekaran et al. reported that 88% children who had more than two vertebral body loss had progressive deformity (Type 1 progression). Besides, the deformity continued to evolve as the child got older even after healing of the infection (Type 2 progression). Children, especially less than 5-year-olds, tend to present with a more extensive disease compared to adults. This is probably because of delayed diagnosis and relatively more cartilaginous nature of the spinal column.It is important to anticipate deformity in childhood tuberculosis to prevent severe kyphosis as the child grows. Rajasekaran’s ‘spine-at-risk’ signs can help to identify such patients. These signs are essentially indicative of posterior spinal column failure. The signs are based on radiographs and include retropulsion, separation of facets, toppling and lateral translation. The presence of 2 or more signs is an indication for early surgery even in the absence of neurological deficit. It is also important to remember that the child who has a stable spine (<2 spine-at-risk signs) at presentation can develop instability in the course of treatment even if the infection is under control.Reconstruction of the spine in children is challenging especially in the young (<8-year-olds) and in those that present with extensive spinal column destruction. The posterior elements are small, and instrumentation can be technically challenging. The surgeon may have to use a combination of strategies to stabilize the pediatric spinal column, including pedicle screws instrumentation, augmentation using tapes (Mersilene) or wires, anterior column reconstruction and postoperative bracing or casting. It is important to be aggressive regarding spinal column reconstruction in children. It is important to review and consider various clinical scenarios that could be responsible for a poor response to medical treatment. Involving the physician in the decision-making process is imperative.8.1.3.1. Mechanical or instability related painIn adults, spinal instability may manifest as mechanical back pain not improving with chemotherapy. Worsening of pain and mechanical instability after a conservative trial of bracing and chemotherapy is a relative indication for surgery. If the clinical and radiological response to chemotherapy is poor (progressive of infection with new lesions), a biopsy for culture and DST is indicated. If conclusive evidence of drug resistance cannot be obtained, debridement and spinal column reconstruction may be indicated. MDR-TB not responding to chemotherapy, especially XDR TB may need surgery to decrease disease burden. Lastly, it is important to entertain the possibility of non-tuberculous diagnosis in a patient who does not show a response to chemotherapy. Again, biopsy or surgery may be indicated to establish the diagnosis. As tuberculosis affects the anterior spinal column, anterior debridement and fusion has long been the gold standard of treatment. It has several advantages, which include direct access to pathology, safe and effective decompression without handling of the spinal cord and optimal reconstruction of the anterior column without damaging intact posterior elements. It is ideal for treating one or two level involvement, especially in the mid thoracic spine in an otherwise young and healthy individual. Patients with comorbidities, especially osteoporosis or preexisting pulmonary pathology are not ideal candidates. Anterior approach to the cervicothoracic and lumbosacral area is difficult due to regional anatomy. In patients with extensive spinal destruction (more than 2 VB loss in the thoracic spine and more than 1 VB loss in thoracolumbar and lumbar spine) or severe kyphosis, standalone anterior spinal instrumentation is biomechanically inferior to posterior pedicle screw construct. Furthermore, in the past few decades, surgeons have gained expertise in accessing the anterior column via the posterior approach, and the indications for a standalone anterior surgery are dwindling. In the cervical spine and anteriorly accessible regions of the cervicothoracic spine, anterior approach and fusion remain the gold standard. Rarely, tuberculosis presents as posterior element disease with spinal cord compression. In these patients, a standalone posterior approach is an obvious choice. In patients with less severe anterior column destruction, a posterior approach to decompress the spinal cord via transfacetal or transpedicular approach may be successful. As the antibiotics heal the anterior column and restore its integrity, the posterior instrumentation helps to maintain spinal alignment. However, frequently the technique of spinal cord decompression via a posterior approach may involve excision of anterior column sufficient enough to warrant grafting of anterior column. It is important not to compromise spinal cord decompression in an attempt to avoid anterior column reconstruction. This approach is most popular to treat spinal tuberculosis of the thoracic and lumbar area. The posterior approach is the workhorse of a spinal surgeon, and most surgeons are far more comfortable with it compared to the anterior approach. As per necessity, a progressive sacrifice of the posterior elements can provide increasing access to the anterior column. (Transfacetal, transpedicular, extracavitary lateral approach). Anterior reconstruction is challenging when a cage of graft needs to be implanted, especially if it spans multiple levels. In the lumbar region, this is even more challenging as the lumbar nerve roots have to be protected while approaching the anterior column. The approach also may involve spinal cord handling if one is not careful, and frequently a less experienced surgeon may end up doing a suboptimal job fearing injuring to the neural structures. 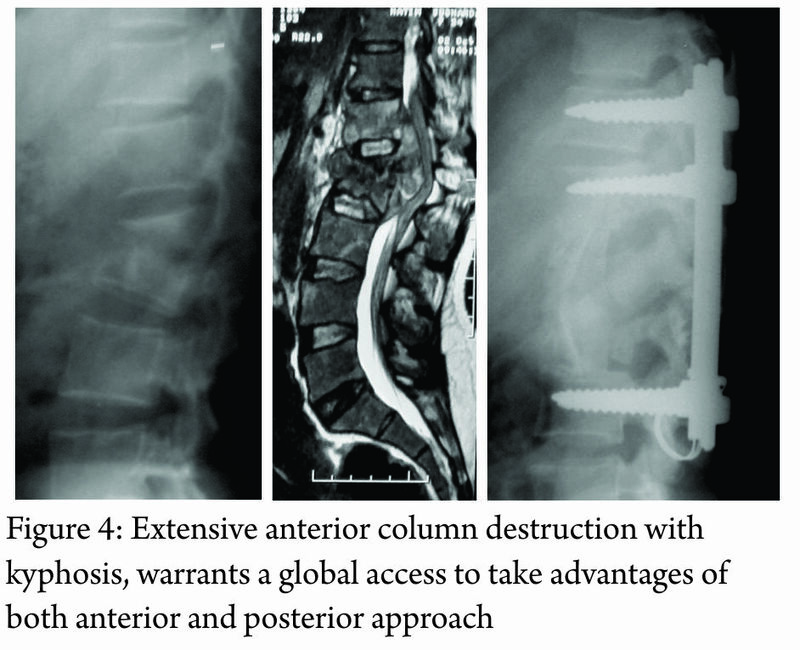 Extensive anterior column destruction (3 or more vertebral bodies in thoracic spine or more than 1 vertebral body in the lumbar spine) with or without severe kyphosis, warrants a global access to take advantages of both anterior and posterior approach (Figure 4). Usually, posterior approach is performed first to correct the alignment and stabilize the spine followed by anterior spinal cord decompression and reconstruction using a structural graft or cage. A global approach can be morbid and potentially could be staged to avoid complications. 29. Clinical features can be subtle, and the clinician needs to have a high degree of suspicion for spinal tuberculosis to be able to diagnose this infection early. 31. A biopsy is recommended not only for diagnosis but also to treat it with effective antibiotics. 34. It is advisable to involve a chest physician or an infection disease specialist early in the course of treatment. 36. Surgical management is reserved for complications of spinal tuberculosis. 37. Childhood spinal TB can have a malignant progression of deformity, in spite of effective medical management and these should be identified early. 38. The treating physician or orthopedic surgeon should be cognisant of the indications for surgery and make an appropriate referral to a spine surgeon, especially in children. This review article is a summary of the symposium conducted by Bombay Orthopaedic Society at KEM Hospital in November 2016. The focus of this discussion was primarily on nonoperative management of spinal tuberculosis. We would like to thank and acknowledge Dr. Abhay Nene, Dr. Mihir Bapat, Dr. Amit Sharma, Dr. Vishal Kundnani, and Dr. Samir Dalvie for their participation in this symposium. We would like to especially thank our guest speakers Dr. Vikas Punamiya (Chest Physician, Breach Candy Hospital) and Dr. Shashikala Shivaprakash (Head of Microbiology at Sir HN Reliance Foundation Hospital) for sharing their expertise and knowledge regarding this topic with the members of the Bombay Orthopedic Society. 1. Tuli SM. Historical aspects of Pott’s disease (spinal tuberculosis) management. Eur Spine J. 2013 Jun;22(Suppl 4):529-38. 2. Pande KC, Babhulkar SS. Atypical spinal tuberculosis. Clin Orthop Relat Res. 2002 May; (398):67-74. 3. Jain AK, Dhammi IK. Tuberculosis of the spine: a review. Clin Orthop Relat Res. 2007 Jul; 460(460):39-49. 4. Jain AK, Kumar J. Tuberculosis of spine: neurological deficit. Eur Spine J. 2013 Jun;22 (Suppl 4):624-33. 5 . Rajasekaran S, Soundarapandian S. Progression of kyphosis in tuberculosis of the spine treated by anterior arthrodesis. J Bone Joint Surg Am. 1989 Oct;71(9):1314-23. 6. Rajasekaran S. The natural history of post- tubercular kyphosis in children and the patterns of progress under the period of growth. J Bone Joint Surg Br. 2001;83-B:954-62. 7. Rajasekaran S. Kyphotic deformity in spinal tuberculosis and its management. Int Orthop. 2012 Feb;36(2):359-65. 8. Rajasekaran S. The problem of deformity in spinal tuberculosis. Clin Orthop Relat Res. 2002 May;(398):85-92. 9. Rajasekaran S, Shanmugasundaram TK. Prediction of the angle of gibbus deformity in tuberculosis of the spine. J Bone Joint Surg Am. 1987 Apr;69(4):503-9. 10. Rajasekaran S. Buckling collapse of the spine in childhood spinal tuberculosis. Clin Orthop Relat Res. 2007 Jul;460(460):86-92. 11. Jain AK, Jena SK, Singh MP, Dhammi IK, Ramachadran VG, Dev G. Evaluation of clinico- radiological, bacteriological, serological, molecular and histological diagnosis of osteoarticular tuberculosis. Indian J Orthop. 2008 Apr;42(2):173-7. 12. Jain AK, Sreenivasan R, Saini NS, Kumar S, Jain S, Dhammi IK. Magnetic resonance evaluation of tubercular lesion in spine. Int Orthop. 2012 Feb;36(2):261-9. 12. Agashe V, Shenai S, Mohrir G, Deshmukh M, Bhaduri A, Deshpande R, Mehta A, Rodrigues C. Osteoarticular tuberculosis-diagnostic solutions in a disease endemic region. J Infect Dev Ctries. 2009;3(7):511-6. 13. Brodie D, Schluger NW. The diagnosis of tuberculosis. Clin Chest Med. 2005 Jun;26(2): 247-71: vi. 14. Ansari S, Amanullah MF, Ahmad K, Rauniyar RK. Pott’s spine: diagnostic imaging modalities and technology advancements. N Am J Med Sci. 2013 Jul;5(7):404-11. 15. Jung NY, Jee WH, Ha KY, Park CK, Byun JY. Discrimination of tuberculous spondylitis from pyogenic spondylitis on MRI. AJR Am J Roentgenol. 2004 Jun;182(6):1405-10. 16. Jain AK, Aggarwal A, Mehrotra G. Correlation of canal encroachment with neurological deficit in tuberculosis of the spine. Int Orthop. 1999;23(2):85-6. 17. Rajasekaran S, Khandelwal G. Drug therapy in spinal tuberculosis. Eur Spine J. 2013 Jun;22 (Suppl 4):587-93. 18. Prasad R. Multidrug and extensively drug- resistant tuberculosis management: Evidences and controversies. Lung India. 2012 Apr;29(2): 154-9. 19. Pawar U, et. al.. Multidrug-resistant tuberculosis of the spine-is it the beginning of the end? A study of twenty-five culture proven multidrug-resistant tuberculosis spine patients. Spine (Phila Pa 1976). 2009 Oct 15;34(22):E806-10. 20. Hodgson AR, Stock FE. Anterior spinal fusion a preliminary communication on the radical treatment of Pott’s disease and Pott’s paraplegia. Br J Surg. 1956 Nov;44(185):266-75. 21. Wilkinson MC. Tuberculosis of the spine treated by chemotherapy and operative de ́bridement.Along-termfollow-upstudy. J Bone Joint Surg Am. 1969 Oct;51(7):1331-42. 22. Tuli SM. Results of treatment of spinal tuberculosis by “middle-path” regime. J Bone Joint Surg Br. 1975 Feb;57(1):13-23. 23. Bailey HL, Gabriel M, Hodgson AR, Shin JS. Tuberculosis of the spine in children. Operative findings and results in one hundred consecutive patients treated by removal of the lesion and anterior grafting. J Bone Joint Surg Am. 1972 Dec;54(8):1633-57. 24. Thirteenth Report of the Medical Research Council Working Party on Tuberculosis of the Spine. A 15-year assessment of controlled trials of the management of tuberculosis of the spine in Korea and Hong Kong. J Bone Joint Surg Br. 1998 May;80(3):456-62. 25. A controlled trial of anterior spinal fusion and de ́bridement in the surgical management of tuberculosis of the spine in patients on standard chemotherapy: a study in two centres in South Africa. Seventh Report of the Medical Research Council Working Party on tuberculosis of the spine. Tubercle. 1978 Jun;59(2):79-105. 26. Parthasarathy R, Sriram K, Santha T, Prabhakar R, Somasundaram PR, Sivasubramanian S. Short-course chemotherapy for tuberculosis of the spine. A comparison between ambulant treatment and radical surgery-ten-year report. J Bone Joint Surg Br. 1999 May;81(3):464-71. 27. Oga M, Arizono T, Takasita M, Sugioka Y. Evaluation of the risk of instrumentation as a foreign body in spinal tuberculosis. Clinical and biologic study. Spine (Phila Pa 1976). 1993 Oct 1; 18(13):1890-4. 28. Jain AK, Jain S. Instrumented stabilization in spinal tuberculosis. Int Orthop. 2012 Feb;36(2): 285-92. 29. Laheri VJ, Badhe NP, Dewnany GT. Single stage decompression, anterior interbody fusion and posterior instrumentation for tuberculous kyphosis of the dorso-lumbar spine. Spinal Cord. 2001 Aug;39(8):429-36. 30. Rajasekaran S, Rishi Mugesh Kanna P, Shetty AP. Closing-opening wedge osteotomy for severe, rigid, thoracolumbar post-tubercular kyphosis. Eur Spine J. 2011 Mar;20(3):343-8. How to Cite this article: Chaudhary K, Dhawale A, Chaddha R, Laheri V. Spinal Tuberculosis – an Update. Journal of Clinical Orthopaedics Jan – June 2017; 2(1):31-42.